I’ve recently been working on developing an iOS application for Sirportly — a helpdesk product which we run & develop at aTech. As part of this application, it became necessary for the Sirportly application to be able to send push notifications to users iOS devices. The Apple Push Notification Service (or APNS for short) is a service provided by Apple to iOS developers to enable them to send notifications to any iOS device which has installed their application. In order to do this, your service-side application must open a secure connection to the APNS service and send any notifications in binary across this persistent connection. Unfortunately, many developers are unfamiliar with this technology and more happy working with HTTP APIs. There is also the additional overhead of worrying about maintaining persistent connections to Apple to avoid being blacklisted for repeated re-connections. Monitoring of the Apple Feedback channels to ensure that devices which uninstall your application are no longer delivered notifications. Ability to support multiple applications with multiple environments and authentication keys. 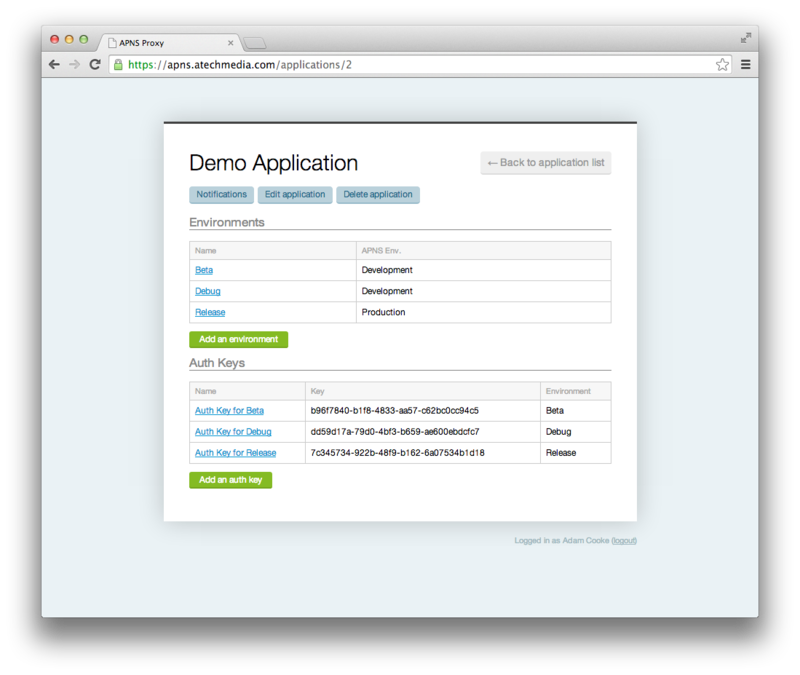 Full documentation about using the APNS Proxy is provided within the repository’s README. This includes information about installing the server software and using the API to deliver notifications to it. It’s pretty simple to get started. It only took a few seconds for me to deploy a new instances for my own use to Viaduct. If you follow Apple guidance and create a private key using Keychain Access, you’ll be presented with a P12 private key file. You will also have a CER file from Apple once you have uploaded your signing request. The APNS Proxy service needs these keys to be provided in PEM format. To help with this conversion, I’ve made a small command line utility called apns-key-convert which takes your two key files and spits out a PEM file which you can just upload into the appropriate APNS Proxy environment.